"King of Dust Free Tile Removal"
"King of Clean Tile Removal"
We are the original service provider and the inventor of the world’s only patented dust free tile removal system known as the DustRam® System in the Phoenix Metro areas. Call us TODAY (480) 907-0470 to get on our schedule for removal. This is a premium service for removing tile, Saltillo, stone, slate, concrete and wood flooring dust free. 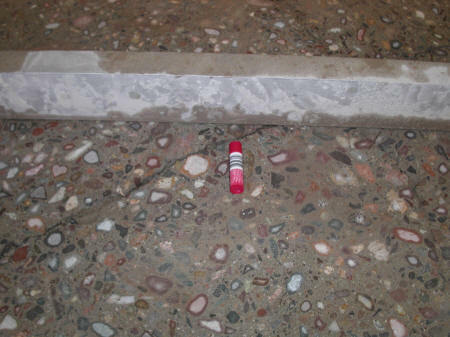 We also can provide a referral to one of our contractors who uses the DustRam® System for floor preparation & flattening to a tolerance of 1/16″ in 50 linear feet. 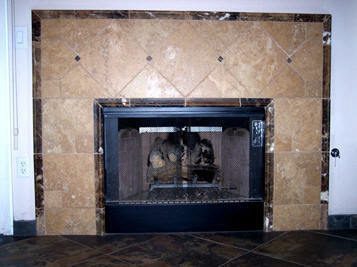 Please visit Arizona Home Floors for more information on these amazing services! Before inventing the DustRam® System, Jack King was a source for high-quality floor installations, dust free concrete grinding, dust free concrete leveling, tile removal, wood floor removal, and stone floor removal. All of our crew members are experts. I can truly appreciate the large amount of time that you may be spending researching the many aspects of your new Floor Covering(s). Perhaps you have already been to some of the larger floor covering stores. The more information that you have the more likely you will be happy with your purchase! I know that some people choose to do business with large and diversified companies, while others prefer those which are more focused. I would like to present my company to you as an alternative to those larger ones. Our mission statement is brief, to the point and accurate. I and those I have chosen to work with me in your home are experts in our fields. 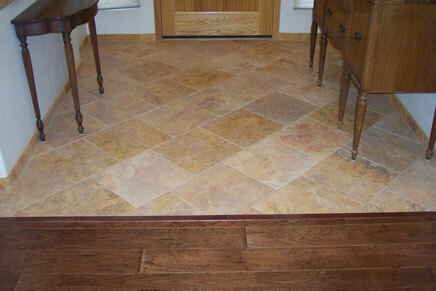 The niche that we have carved for ourselves is Residential Flooring Remodeling. This, in my opinion, is perhaps one of the hardest areas to be consistent in. Usually, the customer(s) are already residing in the home, with children, pets, etc. Furniture, appliances, clothes and more are there also and should be considered as part of the total installation for a successful outcome. Commercial jobs, while we occasionally install a few every year, is not our first choice. Almost without exception, commercial work has too many unknowns, like other subcontractors running behind schedule, or worse, trying to work with us at the same time in your home. The kind of quality work that we are capable of, and what you would be hoping for, is above and beyond what a person would normally be used to seeing, and therefore it requires it to be done in a certain way without that needless rush. Even if I don’t sell or install your Floor Coverings, the information contained here will help you to recognize if you are receiving a strong and reliable floor installation; one that will last through the years! I have also given you hints and ideas about preparing for your installation. We also accept all major Credit Cards through PayPal so there is no need to lose your frequent flier miles! When you are ready for a Professional Onsite Consultation, we provide a detailed and informative computer-generated printout while at your home or business. We excel in all aspects of floor preparation and don’t let the fact that you have uneven subfloors detour you in your desire to have large tiles, stone, wood, or laminate installed. We are one of the very few companies that own large grinders that allows us to shave large amounts of concrete quickly from your floor…… DUST FREE! Ask the contractors that you’re getting estimates from if they have one. They probably don’t! 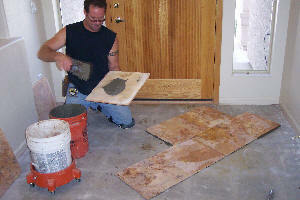 We excel in all areas of concrete grinding and concrete leveling. We have about $75,000 in concrete grinding and concrete leveling equipment. When I or any of my crews are working on your floor installation, we go the extra mile knowing that’s what it takes to make a good job into a great one! When it comes to thin-set, grout, adhesives, additives, seam tape, sealers, etc., we use only Premium installation components versus the cheaper or inferior ones. If what you are looking for is “Real Value For Your Money Spent – With Exceptional Floor Installation and Service,” then please investigate my web site further. There are other Floor Installation companies, but as you continue to explore the information throughout this website, I hope you will see why mine is different from them in some very important ways. This difference completes the value and adds a relaxing certainty to the outcome of your investment! In these forthcoming pages, it is my hope that you will come away with a new awareness of the many different types of Flooring, the way the floor is prepared, how it’s installed, and also what’s available. Serving the Phoenix Metro areas, including Ahwatukee, Apache Junction, Casa Grande, Chandler, Central Phoenix, Desert Mountain, East Valley, Gilbert, Gold Canyon, Maricopa, Mesa, Paradise Valley, Peoria, Phx, Queen Creek, Scottsdale, Tempe, Prescott, Prescott Valley, Cottonwood, Sedona, Flagstaff. Call us TODAY (480) 418-1635 to get on our schedule for removal.